The ECONO EV Series Vapor Phase GAC Adsorbers are fabricated from carbon steel and provided with a high solids epoxy lining for long life. The ECONO EV units are designed to work in the up-flow operating mode. These units employ plenum air distribution systems, which provide superior performance compared to pipe distributors. The GAC vapor phase adsorption units have a screened drain and 20 inch bolted top manway for easy access. The forklift access slots, lifting lugs and overall height make this unit truly transportable. These economical units can be filled with any of TIGG’s media including activated carbon, odor removal media, acid gas removal media and perform well in low flow high media usage applications. 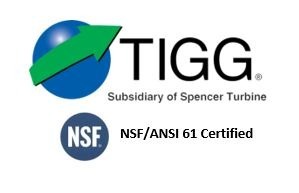 For more information about TIGG’s Econo EV Activated Carbon Steel Vessel Adsorbers, call 1-724-703-3020 or click here to contact us.